Advice and tools for making the most out of your field agent, including new feats, spells, and traits to establish your Pathfinder as an adventurer worthy of the title. A detailed look at the three branches of the Pathfinder Society—the Swords, the Scrolls, and the Spells—as well as the types of Pathfinders who flock to these sects. A new prestige class for Pathfinder field agents, versatile adventurers trained to handle all types of situations with their wide variety of potent skills and abilities. New variant wayfinders and other useful magic items Pathfinders can employ in the field. New ioun stones—legendary magic gems that fit into a Pathfinder’s wayfinder and grant significant powers—as well as flawed and cracked varieties of each. Details on various volumes of the Pathfinder Chronicles, new vanities for Pathfinder Society Organized Play, and information on joining this ongoing worldwide campaign. Written by John Compton & Mark Moreland. Cover Art by Taylor Fischer. I purchased this book, because I was looking for some new ways to use my Prestige Points and I wanted a little more information on the factions. However, there is not much in the way of expanding on factions, or on useful ways to spend Prestige Points. All of the information here should be included in the Guide To PFS. It shouldn't be an extra ten dollars of useless information. Before I knew what I was doing in PFS, I bought this thinking (as the game store owner convinced me) that it was a useful companion for PFS play. I have found it a pointless investment. Skip it. You'll miss nothing of importance. Hit the open road, Jack, and don't you come back. CRobledo's review hit the nail on the head. This booklet is riddled with information that has already been detailed in previous products. The magic items detailed inside are either not very useful, or shockingly expensive. The first aid gloves are an outlier, but they're an outlier that trivialises death consequences in the game and makes it okay to have combats where a PC drops every round. The authors did realize that the average Pathfinder only makes around 120k by the time they reach level 12, right? I only ask because having a 200k item is just wasting book space. The prestige class is lacking in power and theme. The advancements to Wayfinders are pretty poor to boot, and forcing folks to spend prestige to gain them isn't winning any friends either. I bought this pdf because I needed the spell *Sure Casting*. I was hoping there'd be something else in here worthwhile, but there really wasn't. Pick up Seeker of Secrets or Field Guide instead. Basics: This book delves deeper into the Pathfinder Society continuing the background knowledge that was presented in Pathfinder Society Field Guide. The book starts with a general explanation of the Pathfinder Society leading to a section on how to build a well rounded pathfinder for a game. From there, the book runs through joining the society and the three main subgroups while giving different feats, spells, abilities, and traits for each. After the main groups, the book presents a prestige class called the Pathfinder Field Agent who is a bit of a mixed bag. The main way to identify a pathfinder is his/her wayfinder, and this book give new versions of the wayfinder as well as ioun stones that can be socketed into the wayfinder with new powers for both and magic items that any pathfinder would need on their adventures. Near the end of the book, Pathfinder Chronicles are discussed giving new, non-magical ways to boost skills after pathfinders read these books for one hour. The book closes with Pathfinder Society vanities, ways to spend prestige points gained in the pathfinder society, and a short section on Pathfinder Society Organized Play. As someone very invested in PFS Organized Play, this is one of my favourite Player Companions to date. I appreciate the focus on the Pathfinder Society as an organization first, when compared with something like the Pathfinder Society Field Guide. I also very much like the focus on how Pathfinders are similar and different from other adventurers. To that end, the sections that cover character building and joining the society are great, and should frankly be required reading for someone who has played more than a few sessions of PFS (Read: I'm tired of seeing the 7 Int/7 Wis/7 Cha characters who somehow made the cut and became Pathfinders). Featwise, there are some poorer choices than others, but that's not new for Paizo. Improved Day Job and Steadfast Mind seem to be entirely for padding word count, and it's those feats that are making me wish for a 4.5 star rating. Oh well, other options make up for it. Planned Spontaneity and Emergency Attunement are both fantastic feats (the former possibly a bit too powerful for the already strong prepared spellcasters), and I really like Cut Your Losses. The traits added are nice, although I worry that with Canny Wordplay, Charisma is becoming more of a dump stat than it ever has been. However, Ultimate Campaign already crossed that barrier. Insistent Benefactor and Muscle of the Society are both winners. The prestige class is weaker than going single classed, but that's how all prestige classes are in Pathfinder. As is, the Pathfinder Field Agent has some cool abilities, and a character that takes that class will be able to emulate the Society's focus. Weaker than some, but still good enough, and certainly cool enough. I'm happy to see new ioun stones and resonances, but I'm happier still to see new PFS vanities. Please keep adding these Paizo! The other magic items and spells available are all conducive to the Society's motto, and I have no complaints about them. Other reviewers have complained about this, but sections like 'Five Spells Every Pathfinder Should Know' need to keep happening. Not only is this good advice for players, but it makes so much sense that operatives trained by an organization would go into things with a similar idea of how to be prepared. Art is good, but Amiri looks a little dopey in her picture. Maybe she's about to sneeze? All in all, this book is exactly what I want in a Companion. You educate me on the organization, give me some insights into its philosophy, and give some new and different options and items, all without too much power creep. Bravo. I also covered this book on our Ontario Pathfinders website! Sounds interesting, especially some of those guarded secrects. Is this expected to replace the Field Guide in the default assumption? Will we see a retcon to the weird training/indentured servitude thing? I expected another Pathfinder Society Book... Looking forward to the new Vanities, new wayfinders and ioun stones. Hopefully most of them won't be reprints. I'm desperate for the return of the Seekers of Secrets fluff explanation of what an acolyte goes through to become a member. See board threads regarding concepts that are good at fitting into the core conceit of the campaign. Also, I believe that having THE book on PFS written by the guy in charge of the OP program is a good move, previous Society books had just too many authors between them. How many times will the well be returned to? Not all of us are PFS members. Clearly enough are, or these wouldn't keep coming out. I had once believed that I could never have enough Ioun Stones. This is clearly a test of that belief. Sorry, I'm grouchy about the Player Companion line. I do not care for the new format. Far too much space taken up with pictures, and I don't find any utility in the character suggestion pieces, which take up a lot of space. Between that and some of the upcoming subject choices for the line, like this one, I am close to dropping my subscription. Another PFS book? I also agree that these are coming out too often. The thing is there should be enough material by now for a single compiled book that we could consider to be core assumption, but now there are three separate books written about pathfinder society with different sets of information. I think it would be a better idea to just compile all this into the free Guide to Pathfinder Society Organized Play PDF and then just sell a print version of the same book. The print edition would still be less expensive and less of a hassle then trying to print everything out on a printer. So you think every other year is too often for a product to support Paizo's largest marketing campaign? Many many people would say its not often enough. Maybe this book will be worth it, but by the description alone this looks like a cut back version of Seekers of Secrets. I would like to see PFS get the same kind of excellent treatment that the Inner Sea World Guide got by its third incarnation instead of remaining as a bunch of small books with a lot of duplicate information. For those of us who do not play in the Society, having the books come out every other year as part of the subscription is a bit annoying. As I noted when the Pathfinder Society Field Guide came out, the notes in the Foreward about using the information in non-PFS games were... lacking, and felt unwelcoming. I am hopeful this volume will be more useful for NON-PFS play. I also must agree with Azazyll about the new format. Some things I like... roles, for example... but the layout feels wasteful. The inclusion of one-row tables with five columns feels like it generates excessive wasted space in the layout. The two-page spread on vampire transformations to detail three feats in Blood of the Night is another example. I think your moniker may reveal the source of the problem: you're a DM! DMs read everything, remember obscure lore and become immersed in the setting. Most of my players think reading a whole 32 pages in preparation for a campaign is a bit of a chore: if it is short chunks of engaging writing with cool art then they are much more likely to read it. I do think that roles are a bit vague and don't make much sense to the uninitiated reader: which is who they're for. accompanying art for every role. An opening question like: "So, you want to play a vampire hunter?" Player friendly prose, especially in the sub-headings:'Class Options' is fine but then the subheading should be the class and then a short bit of prose... currently it feels cluttered and confusing. Barbarian Shoanti outriders ride into battle on powerful, well-trained steeds Mounted Fury archetype, Ferocious Steed rage power They are devoted to the spirits of the Quah Spirit Totem rage power and fight with a fierce energy Powerful Blow rage power. Ranger Shonati Outriders are masters of their steeds Horse Lord archetype, Horse hunter's bond and fight with the traditional Earthbreaker and Klar Weapon and Shield combat style. These rangers face fierce animals, human bandits and terrible orcs from the Holds of Belzken favoured enemy: Animal, Human, Orc as they patrol the region favoured terrain: Plains, Mountains. Skills The hard lands of the Storval Plateau produce hardy folk: intimidate, ride, survival. I too really dislike, (boardering on hate) the new format. It really comes off as a cheap magazin article that is trying to look good but really just desn't have much to say, so it goes out of it's way to use the format to take up space to draw out the little actual material it has. That's my opinion thus far. I personally hate the "roles" section, which could easily be cut into a 1/4th it's size and give the same info for those that do seem to like it without taking up so much space and spotlight for those who don't. They also leave far too many player option suggestions in the cold. I prefer the older one that just had a line or two for each of the classes. Both more interesting and didn't leave anyone out. That being said, as a PFS player, I am interested in this book. Particularly if it is a mechanics heavy book like it implies and not so much a flavor book which we already have a few of on this specific topic. I do not want to see yet another rehash of the various PF Lodges or the main VCs. I would like to see reasons for Paladin, Clerics, and a few other classes to have incentive to join the PFS (not the other way around). I'd like to see some player focused reasons for characters to work together when they have strong RP reasons not to (and not falling onto the weak "my character would do that" is the wrong answer excuse). Things along the lines of logical reasons that a Paladin/Cleric/Monk type will not risk falling when working with that guy necromancer/Rogue/etc that also just happens to be a pathfinder. . .
Non-metagame reason why characters would remain with the Society when there are conflicts of idiology. Some more info on some of the newer (remaining) Factions would be great. The description strongly implies to me this is a Player's Book, and I hope that is as true as possible. Think of this as a "edition 2.0" of stuff from PFS Field Guide and Seeker. Hopefully there won't be too much organized play specific stuff in here. That can all go into the free PFS OP guide. The stuff in here should be things that are important for anybody who is involved in the in-world PFS. I know that Paizo wants the PFS to be a viable "PC Patron" organization for games regardless of whether it's OP or standard home games (or other one-shot games, for that matter). As such, this is a reasonable supplement, as it covers an important part of Golarion, in a way that hasn't really been done right yet. Also, it's a part of Golarion whose previous coverage is out of print. Complaining about it as a part of a subscription makes no more sense than complaining about a supplement about halflings if you never play them, or tieflings if you don't allow them in your campaign. This is probably the key. These supplements are, I believe, designed as things for players to use to help them get into the setting, rather than as reference works for the GM. Often, gaming supplements confuse the two, meaning that they're too dense for players, but then because players might be reading them, they avoid covering things that the GM needs to know. I too wonder about the treadmill of "official PFS Guides" that are required in the core assumption but are all mutually exclusive. Is it really necessary to force players to keep buying what on the surface appears to be the same material ("Guide to PFS") over and over again? I'm okay with roles, as it's helped a lot of the new people making games here to fit characters into the world of Golarion, without having to read the intimidating ISWG. I don't need roles, but I'm glad to have them. This is my thinking as well. While I don't personally use them, I really like that they're there for new players as well as veteran players who just want a quick guide to a character concept. I'm not sure Blood of the Night used them optimally but that's a topic for a review. I like the new Player's Guide format, they get my PLAYERS excited about aspects of the world they are in. I have new players who haven't read everything. I would be super reluctant to give them a copy of Seekers of Secrets because A) The weird indentured servitude thing and B) It's too much to read. I feel like a few other people here do where on the one hand I think some more vanities, archetypes, feats, and other what not for pfs would be amazing but I really don't want to keep having to update to a new hand book every year like this as a requirement and I worry that it will start to feel like they are just updating to get my money rather then improving the game. That being said if they wanted to start a more active line totally focused on pfs stuff I could be down for that or just drop a big hardback for us that gives us a ton of stuff for pfs that could be interesting as well. I suspect the reason they keep feeling the need for new Society specific books is because of new factions coming and going from PFS. Chances are pretty good we'll be losing one or two factions this year. I think a new Pathfinder Society book makes perfect sense, to be honest. Pathfinder RPG continues to evolve, as does the campaign setting, so it's only natural for the organized play scheme to evolve as well. In addition, copies of previous Pathfinder Society books may become increasingly difficult to find in stores, and they were part of the Pathfinder Campaign Setting line (GM-focused). Finally, the Player Companion line seems like the perfect product line for a book that should speak to the many thousands of players playing at the tables, and Paizo seems to have hit a decent formular with the relaunch of the Player Companion line. 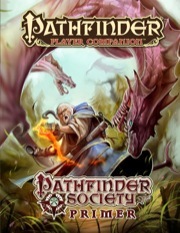 All this mixed together makes for an excellent decision by Paizo to produce another Pathfinder Society book. At least as I see it. I believe that having THE book on PFS written by the guy in charge of the OP program is a good move, previous Society books had just too many authors between them. Mike Brock is 'in charge' of PFS. Mark Moreland is the Developer of the PFS line (as well as the Module Line). Mike Brock is the Campaign Coordinator aka 'The Guy In Charge'. Before him the position was held by Hyrum Savage. Before him was Josh Frost. The first Guy in charge was Nick Logue. It's not at all the same thing, but I understand your confusion. Will this book cover the 8 factions left after two of them get the axe? Or will it have write ups on the current 10 factions? 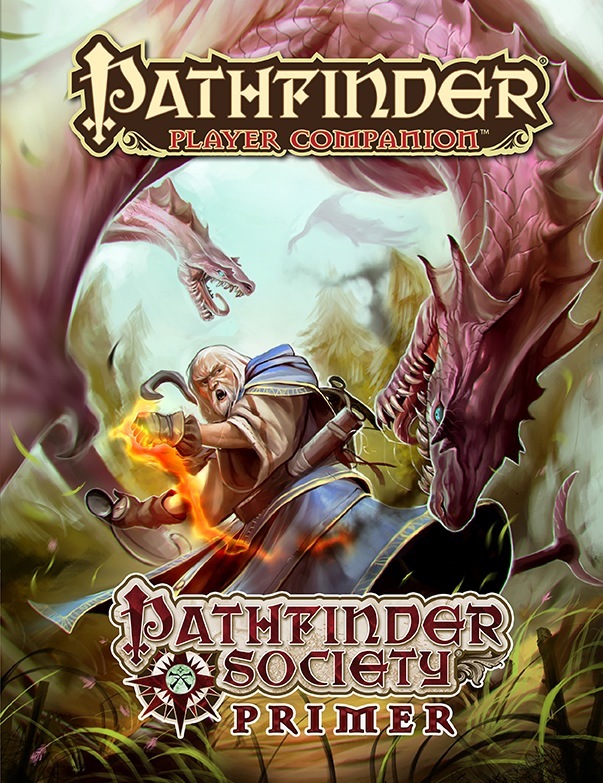 1 - The name of the game is "Pathfinder"
2 - The "Pathfinder Society" is an integral part of the game world, and is used outside of PFS on a regular basis in stories all over Golarion. 3 - Regardless of what you think of the newer layout for Player Companions, have you *ever* seen Paizo put out a "glorified reprint" of *any* material in Pathfinder RPG (post 3.5 days that is)? I'd give them the benefit of the doubt, personally, and just look forward to seeing what new resources players *and* GMs will have available for furthering plot and character development both in-PFS and out. ^This I agree with. I happen to love the new layout except for the fact that it does have some wasted space in some areas. I like some parts and really hate a few areas. Namely roles and so much wasted space with it seems even less non-flavor material. I could be wrong but thats how it seems. As far as reprinting though, that is pretty often. Usually when they reprint something it usually fixes something. It might be small but it usually does. It might simply be clarifying what school of magic the Magic Item belongs to or clarifying a small line in a spell. And Roles I would rather them add in a Page or 2 in the back that has the Role Stat Block or have the Role worked into a short Passage describing the role in a fluffy way. A Black Warden is typically a trained Soldier who is trained to swing for capture with their Hammers and Maces. In the Stat Block in the Back the Stat Block lists Fighter, Paladin, & Ranger as classes. Hammers or Maces as preferred Weapons. Finally the Bludgeoner Feat as a Preferred Feat. If I ever find out whether or not the Viking Archetype is legal in PFS I might just join in a PFS group. Hopefully Springfield, Missouri, USA will get a true PFS and not a Group that just claim PFS as a way to horribly houserule limits into the game. Azaelas Fayth, what is and is not legal for PFS play can be found on the PFS Additional Resources page. But to answer the question, the Viking Archetype is legal, I just made one myself. That is what I get for not checking the Additional Resources section regularly. Now another off-topic question: Is it true that by R.A.W. the Viking only loses the first Armour Training not the other 3? And finally is it June yet? I will take it being May at least. I have to say, I am not particularly happy about this. I only bought Seekers of Secrets because it was part of the core assumption and therefore I, as a PFS player, should have a copy. Then that got replaced by the Field Guide, which I again bought purely because it was labelled as being part of the Core Assumption. Now that is being replaced by this. I am considering not buying this even though I am a PFS player and GM and therefore will be assumed to have it. Truth be told, although I bought the previous two because they were core assumption, I don't think I actually ever needed any information out of them during a PFS game. The only thing I use Seekers of Secrets for is the Beast Scent item, which my character has never actually used in game so I wouldn't miss it. And the Field Guide I use for Day Job rolls - but that table is in the free Organised Guide PDF anyway - and the Farmstead Vanity (which was a GM Boon anyway, so again no big loss). Would it not be better to label this as "highly recommended" to PFS players rather than as part of the core assumption? What information in it is so important that it should be considered part of the core assumption? Are we really saying that in order to play PFS you need to buy this? It's no accident that I'm the author of this book. As far as the Paizo creative team goes, we all have an area (or two or three) of the world that we've sort of claimed as our own. Erik has Nex and parts of Absalom, James has Varisia, Wes has Ustalav, Sutter's got the First World, planets, and Kaer Maga, etc. Mine is the Pathfinder Society (in-world organization and real-world campaign). This book will focus primarily on the in-world organization, however, and won't have a lot (if anything) designed specifically for use in the organized play campaign. While it will all likely be allowed in the campaign (that's up to Mike Brock, as the current Campaign Coordinator), the target audience of the book is anyone who wants to play a Pathfinder in any campaign, whether that's one of our APs, the Pathfinder Society Organized Play campaign, or a homebrew adventure. Hmm, looking forward to this one. I love the Paizo company and the Golarion setting, so please do not take the following comment to be anything but constructive! I too dislike the new format that the Companion books are using, they seem to be cluttered with artwork and random jolts of unnecessary frames and boxes. I am particularly not a fan of the Roles sections. This stems from being a DM who loves being surprised by his player's interpretation of the setting and how they build their characters. Seeing these Roles feels like they are giving uncreative or uninspired characters a cop out and promoting the "Cookie-Cutter" character concept. I do not mind suggestions, or even a quick section that provides the type of feats or skillz a character may be interested in, but to virtually map out the character for the player is a bit of a buzzkill as a DM. Now, as for this product: I love the idea of another Society book coming out. While I do not personally run PFS games most of the time I like my players to be members of the society since it gives good hooks and nice rewards. I would like to see a bit more information that can be used by those who do not run PFS, but that being said all such information is easily adaptable and I look forward to seeing what new developments are in store for the Pathfinder Society as a faction of the setting. This book is geared toward players who want to make characters that are Pathfinders. It makes no assumptions about whether or not those characters are part of the Pathfinder Society Organized Play campaign or home games running through other adventures. -New Wayfinders would be loved! -In the past, the prestige cost to earn the rank of Hellknight or Signifer for the Cheliax faction was a whopping 40 fame. This means a Chelish character has to be around 6-8th level before qualifying, which seems very high. Mostly because the actual written prestige classes for Hellknight and Signifer allow entry well beyond 8th level. Maybe this could be a Hellknight-Captain or Signifer-in-Chief or something? -Consistency in the range and number of permanent prestige rewards for factions would be loved. -Codify some of the +2 masterwork tools to Knowledge skill checks into named Pathfinder Chronicles that may give a minor bonus to some other situation. -New art of the Faction leaders? Please? I think I've seen the same image of Ambrus and Aram 10,000 times now. -A big map with all the locations of the Lodges and which Venture Captain currently runs the lodge would be so useful for GMs running modules and adventure Paths. Nice cover and congratulations to Mark! I know his busy schedule has limited his freelancing time. I look forward to this! What's with the pink dragons? Nice cover but what kind of dragon(or dragon like) creature is that? Cool new prestige class and lots of goodies. Yeah, the cover picture is pretty, but it's got me curious about the details. Besides wondering about the pink dragons, I'm also trying to figure out what spell Ezren's casting, and why he has his wayfinder out and open while doing so. There's a time and a place to be checking the needle on the wayfinder, and the middle of battle isn't it.